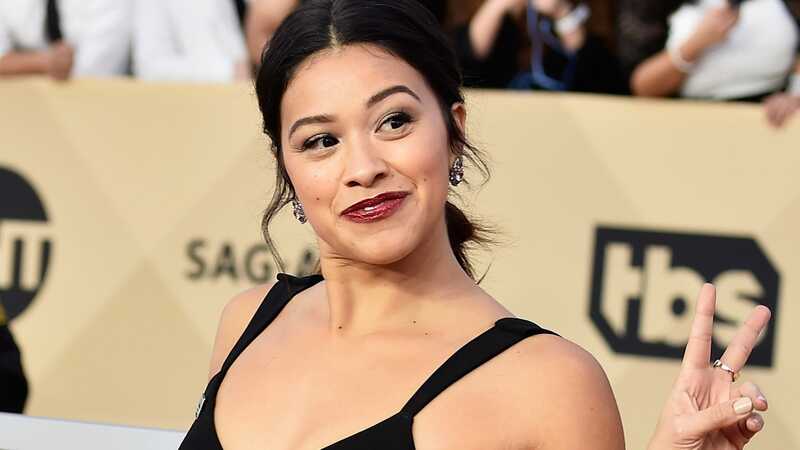 Actress and “Jane the Virgin” star, Gina Rodriguez wants us to know that even though she is not anti-Black, she’s still sorry that the fact that we all misunderstood her has caused us pain. Tuesday, Rodriguez appeared on Sway in the Morning and became very emotional while addressing controversial remarks she has made in the past that left many social media users wondering if she harbored some ill feelings towards Black excellence. After watching the 20 minute video, many bristled at what they perceived to be Rodriguez pitting different women of color against each other, and then fact-checked her statements by pointing out that the highest paid television actress of the year was actually her fellow Latina, Sophia Vergara. This week, the actress admitted that her Sway in The Morning appearance was the first interview she’s done since the backlash where she felt safe enough to address her critics. After taking a moment to sniffle back a sob, she clarified her words. She also went on to explain that as a Latina she recognizes she has African lineage, pointed out her dad is a darker skinned man, and even fondly reminisced about how there weren’t many Latin shows on air when she was growing up, so Black television was what made her feel seen. Then, for the rest of the segment, she basically repeated over and over again how she’s fundamentally a good person, how Black actresses reached out to her to agree that the backlash was silly, and how if she in any way triggered our frayed sensibilities, she was sorry. But still, we all got it wrong. Sorry though. As usual I belong to neither group and probably never will. Rather then being relieved or repulsed by Rodriguez’s response, I instead found myself hopeful but a bit exasperated. It’s clear that she has spent a lot of time distraught over this, reading comment sections, and speaking to her Black friends, but somehow she still missed some key points that have yet to be addressed. If someone is sitting on a panel about what it’s like to be an actress in Hollywood, it is a perfectly reasonable assumption that any comments made about womanhood will be coming from an actress’ perspective. When Rodriguez made her ill fated statements about Latina women making less than Black and Asian women, her audience wasn’t stupid or trigger happy when they assumed she meant Latina actresses since that was literally the topic at hand. If she was in fact pivoting to a broader discussion about blue collar women in the workforce, as someone who gets paid millions to effectively communicate as a public figure, the failure to make that clear was solely on her part. If she had spent less time being defensive and more time objectively acknowledging that, the sincerity level of her apology would have risen considerably. Rodriguez has often spoken about how nervous she gets when speaking on testy topics, so a part of me wants to believe her explanation that she didn’t mean what was said in the way so many of us took it. But if you are so grappled with fear about saying the wrong thing in public, that you end up often having to clarify yourself then perhaps that’s something need to work on rather than blaming your audience. You can’t get mad at folks for taking your poorly chosen words at face value. Our comprehension isn’t the issue here. Which brings us to my next point…. Most people are easily swayed by tears, puppy dog eyes, and other theatrical micro-gestures meant to illicit sympathy from others, but I am not one of those people. In fact if someone is subconsciously using emotional pleas to circumvent taking accountability, I’m always painfully aware of it. And the video of Rodriguez’s interview was a classic example of those dynamics at play. When the topic of the backlash comes up she pauses to withhold a sob, gets teary eyed, and makes eye contact with all the Black people in the room to convey sincerity. Then she waxes poetic about how pure her heart is. Her angst may have been real, but not once, in the entire segment does she ever truly take accountability for anything. I kept waiting for that moment when she admitted to any missteps in all this or at the very least shared how she planned to engage more thoughtfully moving forward. If either of those things had happened I would have gladly applauded her growth, but instead all I heard was a list of reasons why everyone else got it wrong. And not only does she not admit to any mistakes (other than be the innocent victim of blood thirsty Black Twitter), she also subtly tried to rewrite history by stating that people were only mad at her about one video where her words were taken out of context. Gina. Girl. That is false. I’m sure you’ve said this so much now that even you believe it, but still, thats just not the case. Had I been assigned to write about Rodriguez being problematic based solely on that one Net-a-Porter panel with the other actresses, I would have passed because on it’s own, that clip is a flimsy reason to cancel anyone. In this case, however, the panel wasn’t the only thing that annoyed people; instead it was more so the final straw. A point that Rodriguez repeatedly fails to acknowledge as she paints those concerned by her antics as an uninformed angry mob. The reality is, people were also turned off by a comment she made about Oscar-nominated movie, Black Panther, where instead of celebrating the success of the blockbuster like everyone else, she questioned where the Latinos were in Marvel and DC movies. How are you expecting us to buy this story about how you would never pit people of color against each other, when on several occasions you’ve been caught asking, “Well what about us?” when a Black person gets a win? One could easily see how this could bristle the nerves of a community used to being appropriated at picked at. And let’s not forget that infamous clip of Yara Shahidi getting a compliment as a BLACK woman and your knee-jerk reaction to interrupt her exchange in order to throw in what some perceived as an All-Lives-Matter-esque interjection. Luckily that reporter was agile enough to see how what you were doing may not fly with his audience and pivoted the conversation back to his original question. But at what point are you gonna stop playing these reindeer games and simply admit that your critics have very intelligently revealed that you tend to respond to the Black community in a way that comes off as subconscious bias? There’s no shame in that because we all do it. Simply acknowledging a repeated blindspot would have been a much more palatable aproach and would have totally made me, and anyone else seeking resolution, give you props. Instead all we got were tears that turned a conversation of accountability into a plea for sympathy. Any semblance of an apology that the 34-year-old actress made Tuesday was also anchored by her implication that her audience was wrong (about everything) and that the critiques she received had no value. Um, that’s not how apologies work. The intent of a true apology is to show remorse for a misstep, acknowledge pain that you have caused, and bonus points if you also insert next steps for improved behavior. An apology is NOT the time to paint those you are apologizing to as simpleton, give yourself compliments or repeatedly express that you did nothing unsavory. If that’s the case than what exactly are you even apologizing for? A perfect example of a well executed apology is Chance the Rapper addressing his collaborations with R. Kelly. He didn’t skirt the issue, he didn’t speak ad nauseum about how pure his heart is, and he sure as hell didn’t insinuate Black women were tripping over nothing. Instead, he admitted a blindspot, acknowledged a social bias he was previously unaware he had, and then very soberly admitted it was a mistake. He wasn’t defensive but introspective. Plus, he managed to do all that in a fraction of the time it took Rodriguez. Brevity is always an earmark of a sincere remorse because it doesn’t really take that long to own your ish and explain how you’re gonna do better. You know what does take a lot of time though? Being stuck in the victim space, dismissing concerns, and trying to mask that fact that you’re clearly convinced the people you’re apologizing to are actually the ones tripping. Do I believe Gina Rodriguez is a decent human? Sure. I’ve ever once viewed her as a malicious person. But do I buy that she’s stopped being defensive long enough to truly understand why the optics of her actions could be taken the wrong way? Absolutely not. Which is sad because history has shown that when non-Black presenting people convince themselves that our community is “upset over nothing,” it creates an undercurrent of resentment and dis-ease towards us that serves no one. Gina, if you see this, hit me up girl. I’m not even mad anymore, just hella tired of our communities being pitted against each other.